These young, first-time artists just learning to express themselves with their creativity will be given the guidance needed to understand not only how to use certain techniques, tools, and mediums, but how to have fun while learning to observe and work from life and imagination to create beautiful works of art. 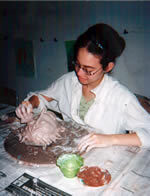 Each class combines different mediums-drawing, painting, sculpture, and ceramics-in a variety of unique projects stressing each young artist's personal creativity. Grouped within a specific age-range (first graders with first graders, etc. 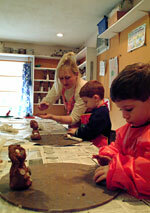 ), these students learn everything from the basics of drawing to various types of painting, sculpture, and ceramics. Students can choose foundational classes, which incorporate all different art mediums, or more specialized classes in drawing & painting or ceramics & pottery wheel. For specific classes, See either Fall to Spring (September to mid-June), or Summer (late June to late August). Check out our Art Mediums for descriptions of what we do in our classes, as well as our Projects Gallery, where student work is proudly exhibited. If you have any questions, please call our Office at 908.604.0773. or e-mail us at admin@creativehandsartstudio.com.